Sioux Falls is the largest city in the U.S. On the 8th (Sat), appreciate the history behind USS South Dakota Battleship Memorial, pause for some serene contemplation at St. Joseph Cathedral, and then hike along SculptureWalk Sioux Falls. Take the guesswork out of planning a Sioux Falls vacation by using our trip itinerary maker. Saint Louis to Sioux Falls is an approximately 6-hour flight. You can also drive; or take a bus. Traveling from Saint Louis in June, expect Sioux Falls to be little chillier, temps between 80°F and 58°F. Finish your sightseeing early on the 8th (Sat) to allow enough time to drive to Keystone. On the 9th (Sun), cruise along Iron Mountain Road, then trek along Presidential Trail, and then explore the wealth of natural beauty at Mount Rushmore National Memorial. To find maps, traveler tips, where to stay, and more tourist information, you can read our Keystone trip planner. Traveling by car from Sioux Falls to Keystone takes 5.5 hours. Alternatively, you can fly; or take a bus. The time zone difference moving from Central Standard Time to Mountain Standard Time is minus 1 hour. Prepare for little chillier weather when traveling from Sioux Falls in June: high temperatures in Keystone hover around 73°F and lows are around 48°F. Wrap up your sightseeing on the 9th (Sun) to allow time to travel to Cody. Start off your visit on the 10th (Mon): see the interesting displays at Cody Firearms Museum, then get engrossed in the history at Buffalo Bill Center of the West, then get your game on at Cody Firearms Experience, LLC, and finally contemplate the long history of Old Trail Town. To see traveler tips, reviews, other places to visit, and tourist information, use the Cody trip itinerary planner. Getting from Keystone to Cody by flight takes about 6 hours. Other options: drive. In June, daytime highs in Cody are 75°F, while nighttime lows are 51°F. Cap off your sightseeing on the 11th (Tue) early enough to go by car to Yellowstone National Park. Visiting S Rim Trail and Old Faithful will get you outdoors. There's much more to do: take in the natural beauty of Upper Geyser Basin, take in breathtaking views at Grand Canyon of the Yellowstone, hike along Artist Point, and take in the dramatic natural features at Lower Geyser Basin. To see where to stay, maps, more things to do, and tourist information, refer to the Yellowstone National Park trip planning website . You can drive from Cody to Yellowstone National Park in 2.5 hours. In June, Yellowstone National Park is little chillier than Cody - with highs of 66°F and lows of 34°F. Finish your sightseeing early on the 13th (Thu) to allow enough time to travel to Glacier National Park. Kick off your visit on the 14th (Fri): take in the dramatic scenery at Virginia Falls, cruise along Going-to-the-Sun Road, and then appreciate the views at Logan Pass. 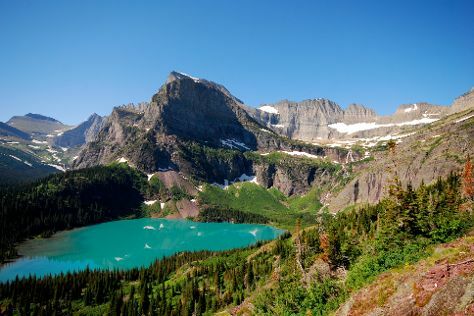 On your second day here, hike along Iceberg Lake Trail and then stroll through Grinnell Glacier. To find where to stay, ratings, other places to visit, and other tourist information, read Glacier National Park online trip builder . Traveling by combination of car, flight, and taxi from Yellowstone National Park to Glacier National Park takes 8 hours. Alternatively, you can drive. Expect somewhat warmer temperatures when traveling from Yellowstone National Park in June; daily highs in Glacier National Park reach 75°F and lows reach 45°F. Finish up your sightseeing early on the 15th (Sat) so you can travel to Moose. Moose is an unincorporated community in Teton County, Wyoming, United States, in the Jackson Hole valley. 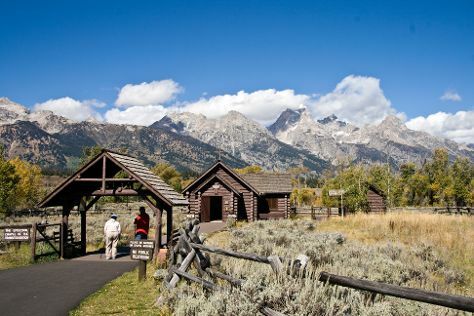 Start off your visit on the 16th (Sun): identify plant and animal life at Grand Teton. On the 17th (Mon), you'll have a packed day of sightseeing: admire the sheer force of Hidden Falls and then tour the pleasant surroundings at Jenny Lake Trail. To see ratings, more things to do, photos, and other tourist information, go to the Moose route planner. Use the Route module to find suitable travel options from Glacier National Park to Moose. Traveling from Glacier National Park in June, plan for little chillier nights in Moose, with lows around 39°F. Wrap up your sightseeing on the 17th (Mon) early enough to travel to Denver. On the 18th (Tue), get curious at Butterfly Pavilion and Insect Center, then contemplate the long history of Union Station, then make a trip to 16th Street Mall, and finally take in nature's colorful creations at Denver Botanic Gardens. To find ratings, reviews, where to stay, and tourist information, read our Denver online trip itinerary planner . The Route module can help you plan travel from Moose to Denver. Prepare for somewhat warmer weather when traveling from Moose in June: high temperatures in Denver hover around 83°F and lows are around 55°F. Wrap up your sightseeing by early afternoon on the 19th (Wed) to allow time for travel to Kansas City. Start off your visit on the 20th (Thu): explore the engaging exhibits at Kaleidoscope, steep yourself in history at Union Station, and then test your team's savvy at popular escape rooms. To find maps, traveler tips, other places to visit, and other tourist information, read Kansas City trip planner . Traveling by flight from Denver to Kansas City takes 5 hours. Alternatively, you can drive; or take a bus. Traveling from Denver to Kansas City, you'll lose 1 hour due to the time zone difference. Traveling from Denver in June, plan for a bit warmer nights in Kansas City, with lows around 69°F. Finish your sightseeing early on the 20th (Thu) so you can travel to Saint Louis. Test the local claim that Saint Louis is second only to Washington, D.C.
On the 21st (Fri), admire nature's wide array of creatures at Saint Louis Zoo, then examine the collection at City Museum, and then browse the collection at Central Public Library. Get ready for a full day of sightseeing on the next day: take in the architecture and atmosphere at Cathedral Basilica of Saint Louis, then steep yourself in history at Missouri Botanical Garden, then admire all the interesting features of Grant's Farm, and finally look for all kinds of wild species at Sachs Butterfly House. To see where to stay, maps, other places to visit, and other tourist information, read Saint Louis online trip planner . Traveling by flight from Kansas City to Saint Louis takes 4 hours. Alternatively, you can drive; or take a bus. In June, plan for daily highs up to 87°F, and evening lows to 67°F. Finish your sightseeing early on the 22nd (Sat) to allow enough time to travel back home.